The painting obviously illustrates the poem, which has been much discussed, some readers even proposing that the boy is the master, having achieved a youthful appearance by ingesting those herbs. It is unusual for Ding to paint such heavily clouded scenery, but in this case the poem required it. The result is an unusual and compelling composition which is as poetic as the work of Jia Dao it illustrates. It is another of Ding’s great landscape paintings from the mature period. Baiyun waishi (‘external secretary among the white clouds’, the real-world office of external secretary being a drafter of proclamations for the emperor) was the literary name (hao) of Yun Shouping (1633 -- 1690), who painted flowers without outlines (cf. 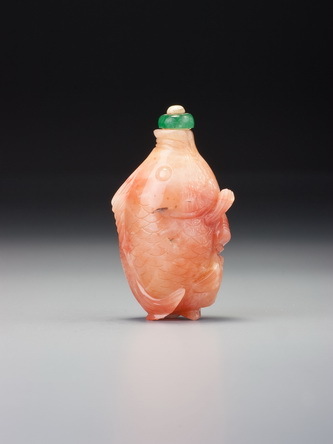 Sale 1, lot 132 and Sale 3, lot 109, the latter by Zhou Leyuan, whose influence is very evident here). The Lu River is the major shipping canal between Beijing and Tianjin. 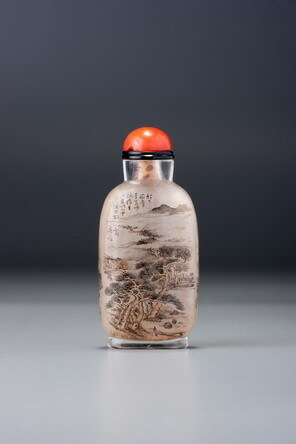 Ding also identifies himself as a native of Lu River (he was born in Tongzhou, apparently) on a bottle in the Mullin Collection (Moss and Sargent 2012, no. 314) and in the title of his collected seal carvings, published in 1935, the year of his death and long after he had left Beijing for Nanjing.